Get that rocker chic look! 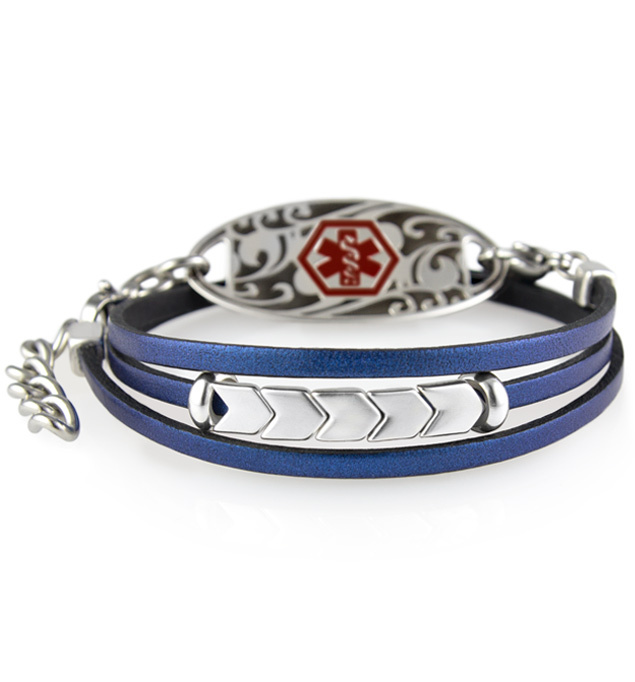 Nina is a leather medical ID wrap bracelet featuring metallic, navy blue leather with silver chevron accents for a fun, edgy look. The Nina Medical ID Wrap stacks beautifully with your favorite cuffs or watches, or you can go for a simpler look by wearing it on its own. Handcrafted by our Kansas City artisans, the Nina Medical ID Wrap is a stylishly simple med alert wrap you’ll love to wear. This on-trend medical ID wrap pairs perfectly with your choice of medical ID tags. All of our med ID tags feature the internationally recognized medical alert symbol on the front, designed to alert EMTs and other first responders to your medical information, which we engrave on the back. Whether you or your loved ones wear a medical alert bracelet for Celiac disease, heart conditions, lymphedema, autoimmune diseases, a history of weight loss surgery, or any other medical condition or treatment consideration, wrap bracelets are a terrific option. On-trend, wrap medical ID bracelets feature custom-engravable medical ID tags, so they’re truly made just for you.